Although IWC has plenty of watch collections, it is arguably their Pilot’s Watches that garner the most attention. Inspired by vintage military aviation watches but built to suit modern expectations, the IWC Pilot’s Watches bridge the gap between yesterday and today. Today we are taking a look at the origins of the Pilot’s Watch and shining a light on the IWC Pilot’s Watch Chronograph IW377709. In 1936, IWC unveiled a watch called “Special Pilot’s Watch.” One of its defining features was the rotating bezel with an arrow to use to record take-off times. The watch also had oversized numerals for optimal legibility and an antimagnetic movement. 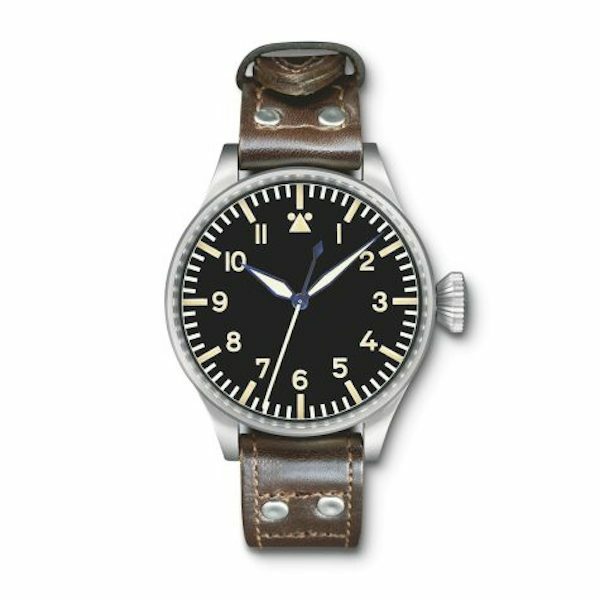 During World War II, the German airforce ordered military-spec watches from a slew of watchmakers. 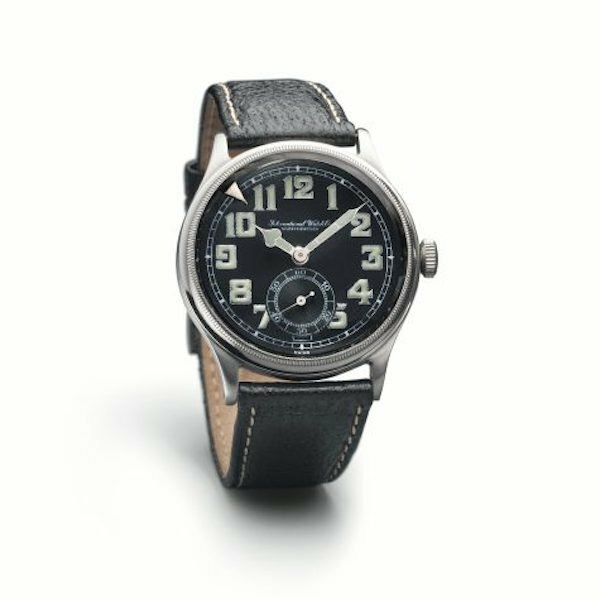 These watches, commonly referred to as Flieger watches or B-Uhren watches, measured a massive 55 mm in diameter, housed black dials, and extra long leather straps. The style of the dials was designed to be simple to read. The hour markers were large Arabic numerals except for the triangle at 12 o’clock flanked by two dots. There was also the minute track around the outer edge of the dial and luminescent center hands. The B-Uhren watches ran on manual-wound pocket watch movements. The movements also included iron shields to ensure their anti-magnetic capabilities. What’s more, the B-Uhren watches included very large winding crowns to permit pilots to use them whilst wearing gloves. In response to the German military’s order, IWC created the Big Pilot’s Watch Calibre 52 T.S.C. in 1940, complying with all the outlined specifications. Only 1,000 units were created, however, these watches laid the design groundwork for future IWC Pilot’s Watches. 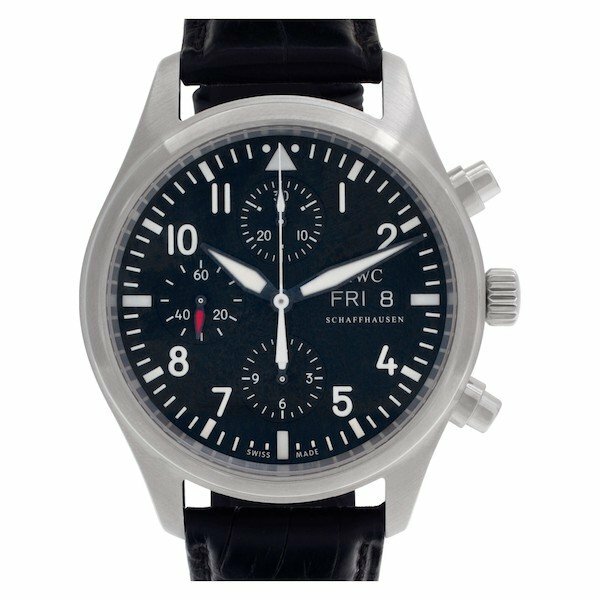 Fast forward to today and we are looking at the IWC Pilot’s Watch Chronograph IW377709–which is part of the company’s current lineup. The ref. 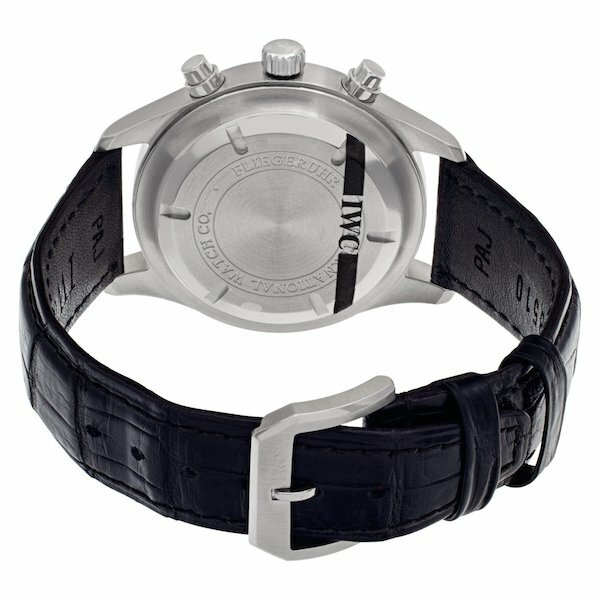 IW377709 features a stainless steel 43 mm case and a black leather strap fitted with a steel tang buckle. Like all IWC Pilot’s Watches, the dial of the ref. IW377709 takes its design cues from those 1940’s Flieger watches. There are the Arabic numerals, the triangle and two dots at 12 o’clock, and the prominent minute track around the periphery on the black surface. Even the shape of the luminous hands is remarkably similar to the WWII IWC watches. 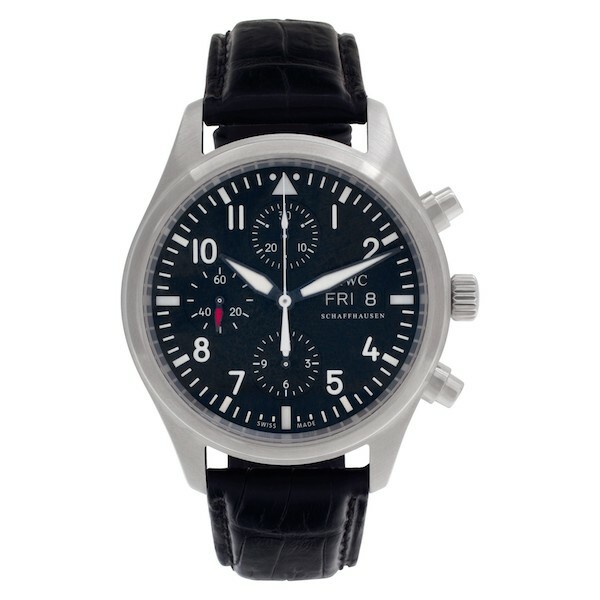 Yet, as a modern chronograph, the IWC Pilot’s Watch Chronograph ref. IW377709 also boasts plenty of additional functionalities. There’s the trio of registers (30-minute counter, 12-hour counter, and running seconds) on the dial to use in conjunction with the chronograph pushers and central chronograph hand. There is also the pair of calendar windows to indicate the day and the date. The watch is packed with functionality, yet in the true essence of the original pilot’s watches, it is easy to read. 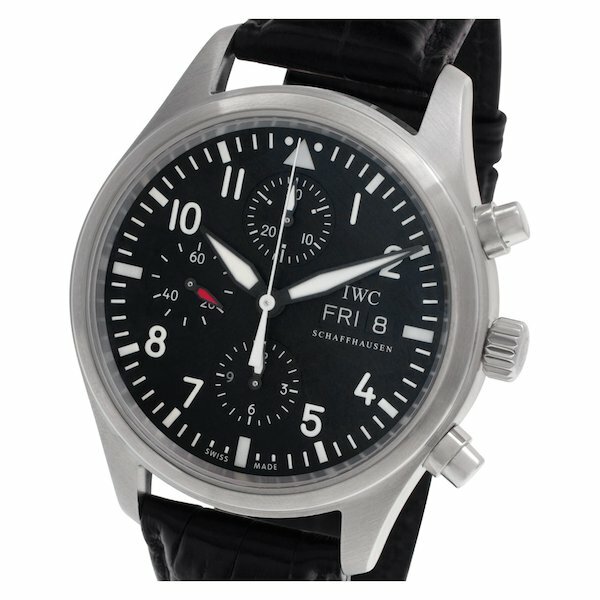 However, unlike the 1940’s versions, the IWC Pilot’s Watch Chronograph ref. IW377709 is an automatic watch. Its powered by the self-winding Caliber 79320 with 44 hours of power reserve. Protecting the movement from magnetic fields is a soft-iron inner case. The exterior caseback is solid stainless steel. With a history that spans eight decades, IWC Pilot’s Watches are undisputable icons in the aviation watches genre. The Pilot’s Watch Chronograph ref. IW377709 is a fantastic balance between paying tribute to the original while offering the practicality and durability of a modern high-end tool watch. It has the best of both worlds.